My mother's filing system was...idiosyncratic. Oh, I'm sure she knew where everything was. But my sister recently unearthed these three folders, and passed them along to me, and ... I got nothing. Two Misc. Papers and one ?. How does one know what one will find in any of those folders? 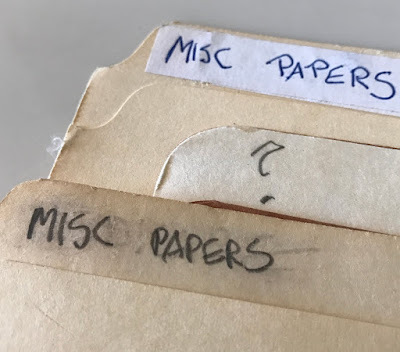 Maybe it's like the mixed-up files of Mrs. Basil E. Frankweiler. Secrets abound? Ah, I can't tell you how many files I have labelled "Miscellaneous" or "Random" or simply "Stuff." Whenever I clean my desk, I just gather up everything, stick in a file, and then puzzle as to what to write on the file. I have a file with exactly that label. It gets used every time I sort my files and discard what is useless. The junk all goes into that file and gets one final look over before it becomes recycle. Just in case. Blushing. Maybe call it discards?